Okay, I want this bike. I mean, really want it. I saw this machine on bikeexif.com not that long ago and was pretty excited to see it show up here. There’s not much left of the original bike, but the distinctive ram air scoop on the top of the cylinder head makes the bike’s origins clear: hiding in there is a 1975 Suzuki GT550. A bit of a forgotten, mid-size model, the two-stroke 550 is generally considered to be less collectable than the larger Suzuki GT750 due to the fact that its displacement of 543 cc’s left it unable to compete in the 500 cc racing classes. When new, the bike made about 48 hp and was undersquare, with the bore slightly smaller than the stroke, imbuing the motor very good torque for its size. The bike featured a ram-air scoop to channel cooling air to the cylinder head. It was intended to compete against Kawasaki’s H1 two-stroke triple, but had a very different character than “The Widowmaker.” Where the H1 was peaky and difficult to launch smoothly, the GT was smooth and torquey. Where the H1 was twitchy, the longer wheelbase GT was stable and confident, with touring aspirations. But the H1’s wild reputation has made it a legend, and the GT550’s sophistication doomed it to relative obscurity, in spite of strong sales when new. 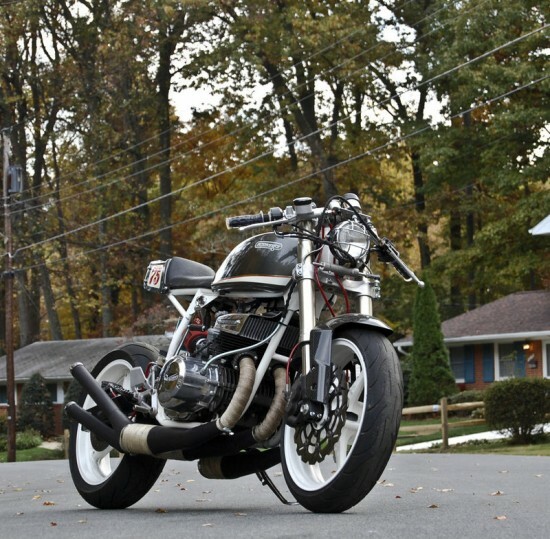 This particular example is a one-of-a-kind creation, with a vintage, slightly overbored heart putting power down through modern suspension: GSX-R forks and front wheel and Kawasaki ZX-6R rear suspension. Virtually everything has been replaced, modified, or upgraded. 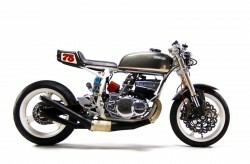 From the original eBay listing: 1975 Custom Suzuki GT550 for Sale. Recent winner of the “Best in show” and “Trick Bits” awards at Fighter Fest 2011 Carlisle PA. Started life as a 1975 Suzuki GT550. Created to combine the old and the new, with updated suspension the bike handles like a modern sportbike with all the charm of a vintage two-stroke motorcycle. 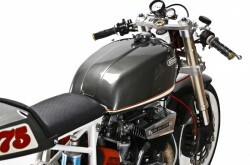 Modifications include custom subframe and tail section. Modified Kawasaki H1 expansion chambers. Elk skin leather seat and fiberglass seat pan. Custom Honda headlight. Kawasaki 636 rear suspension and Suzuki GSXR front forks. 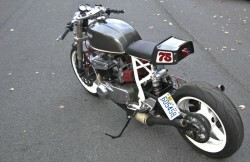 Bike completed entirely, including the paint and graphics, here at MotoHangar. Recently featured in Streetfighter Magazine, BikeExif.com, and various international and local blogs. Soon to be in Option Moto Magazine (France). There’s also a rather poor quality video posted, but it clearly highlights the bike’s ready-to-ride nature. Despite its wild looks, it starts easily and snarls happily down the street. I’ll be watching this one to see how high the bidding goes. Oh, my. That just made my heart beat a little faster. Beautiful!